Making your blog better should be a priority for any blogger. There are many ways you can improve your blog, both in content and looks, but here are six ways to make your blog both functional and appealing. Let’s get to the look of your blog. The way your blog looks is an important part of how your readers react to it. No matter how good your content is it can’t help you if your blog site repels your readers at first glance. It is important to make your blog aesthetically appealing and match your content and target market. For ladies you might have a pink background with kittens and large print. For kids you could have bright colors and bold images. With young people you could have a modern layout with funny images in the background. The idea is to tailor your blog’s look to your audience and content type. You should also make sure the colors are not too bright or too dark and that the overall feel meshes with your topic. The cat blog should not have dog bones on it or palms trees because those just would not fit. After you pick a background and theme, then you need to make sure your blog site is readable. This can mean that your text is visible and easy to read against the color of your background, that your posts are not obscured by ads, and that your posts are not broken up or cut off. I have come across so many sites with great content but they obviously never looked at the site itself because the text is practically unreadable. If your readers will have to cut and paste your text into a Word document to read it then you are losing your readers. Make sure your content gets the showing it deserves and that you read your own blog! Once the looks are down then you need to get to the nitty gritty. Do all the pages load? Can your readers easily go from one post to another? Do you do inside post promotions to show readers related topics inside your blog? The usability of a blog determines how long a reader will stay there. You want your readers to stick around so make sure your blog works well. Double check your blog on another computer or clean out your cookies again to verify that everything is properly functioning. As part of the look of your blog you should include images. Images not only increase your blog’s visual appeal but they also give you another way to connect with readers. Many times people look for images on search engines and if you title and tag your images properly they can garner you some visits. You should make sure your images are free to use or that you created them to avoid legal issues. You should also try to pick images that are compelling in some way. They can be funny, weird, colorful, or just look at things in a new way. Images should always complement your content so make sure that the words and the pictures match. Related to images, multimedia like video, audio, or infographics can be a great way to add interest to your blog posts. It is very simple to make your own videos or create a presentation that can be added to your blog content. By creating multimedia you can also connect to social media spaces like YouTube. Speaking of social media, YouTube, Pinterest, Twitter and Facebook are all great ways to build interest in your blog. Social media provides many connections and the ability to share posts instantly. You can connect your blog easily to social media and have it automatically update with each new blog post. You can also add like buttons and share buttons to your blog posts on your blog site. A Twitter feed may be another great thing to add to your blog site to bring in potential readers and connect the different followers. By using social media to expand your reach you can get lots of new organic traffic in with very little effort, once you have established the connections. Any other tip to add? Yes, the first one is one of the important thing to remember while starting a blog. I mostly love a clean looking as your blog is. First impression is the last impression. Checking for fonts, colors and backgrounds to ensure readability is a must. I usually prefer bigger fonts and a dark colored text and a light background. Coming to images, who doesn’t loves them? Yeah, multimedia is attention grabbing. I always try to use either images, infographics, videos but never tried audio. In my opinion, Social media is the best place for promoting posts. I get a lot of readers from twitter. Thanks Erik for sharing these tips. Enjoyed the post. Yes, this blog layout is clean and free of any advertisement. My favorite social media for marketing is Twitter too. I have many followers there and I love the tools connected to this network. Like JustRetweet, or Triberr, a fantastic community to boost your exposure and audience. Found your post very crisp and appropriate. It would be really simple and cool guide for a new blogger like me. I totally agree to actually all the points you have mentioned especially the usability part. I agree that the blog should be user and reader friendly to make it a hit. Good work. Hope to read much more informative doable articles from you! I’m glad you enjoyed the post, good luck with your new blog. You make a great point about how your blog looks is important. As we know we only have roughly about 6-8 seconds to capture the attention of our readers. What is the first thing that happens when they land on our blog? It is they make a quick judgment about how appealing it is on the eyes. We are visual people, so the look of our blog is very important. This also goes to your point about images. When I started to add images on my blog posts, I noticed right away a difference in visitors. I am glad you mentioned make it readable. That is a blog post all within itself. You cannot have the pitch too small and you do not want it too big either. That is something I think we all have struggled with from time to time, and especially so as a new blogger. I was just speaking to Carol Amato today about liking blog posts that are related. She was giving me some good advice on that. So I appreciate you mentioning it here also. Also, you are correct in that we have to ensure that the reader can easily flow from one area of our blog to another without having to figure things out. Remember, they are on our blogs for their benefit, not ours. I am working on the multimedia aspect and adding so that I can add videos. That means of course getting out of my comfort zone 🙂 I love your point on social media as well. It is a must that we connect our blogs in that way, and there are numerous plugins to make that process very easy. First is always the last impression. The time we have to catch the visitors attention is very short. and after this, writing really good content. We always want to improve our blogs, Nate. It seems hard, but it pays off when the good work is done. Do have a great rest of this week, my friend. You’ve made some great points for new bloggers. The aesthetic look to a blog either keeps me reading or makes me leave in a heartbeat. I personally prefer a white background and a large easy to read font for blogs. I also like blogs that don’t have a lot of ads trying to take my attention away from reading. I really like your style and content! this blog is on purpose without any ads, as an experiment. The feedback of readers is very positive. Lol…you are so right – ladies tend to think ALL pink, and perhaps you might know of it, but the earlier genesis theme of Aha!NOW was all pink and flowery, something that I loved, but I changed over to the present one as we wanted a responsive one for the blog – with a more whiter, clean look, so you are right about that. Making it easy to read and load are such essential points for bloggers because you can easily lose readers otherwise, especially if your content consists of huge chunk of texts, and isn’t formatted well, or has no images, videos etc, and if your blog takes time loading. Also, make sure to have your social profiles set up so that people know where they can reach out and connect with you. Not to mention the issue with most blogs – not adding their Twitter handle to the tweet button!! And you’re right, a lot of Ahaians came to read and comment! You used a Genesis Theme with mainly pink colors? Though, I like the layout of Aha-Now community now. White, clear and clean. Making things easier for the readers is important. Content formatted, social media buttons, RSS feeds subscription optin : they are all parts of the same goal, to increase engagement and positive experience on your site for your readers. I appreciate your comment, Harleena. This is a must read article for every blogger, you’ve shown six ways to make our blogs better, when you talked of text issue, I quickly recalled sometime ago when I was still on the blogger blogging platfor, I used Adamz blogger templates, the font size was very tiny and my readers had to contact me about that. Making our fonts bold enough for our blog reader to be able to see id a quick start. Though the rest listed here should also be put into consideration. Having a good theme and layout is very important. What an awesome content that you’ve given, you always be sharing your secrets with us and giving thanks to your readers. That was mighty sweet of you. Thank you for including me in all of your network and keeping in touching. You’ve loaded this post with a lot of information, A few in particular that I haven’t done yet is adding multimedia. Before that adding Multimedia to our blog does it reduce the loading speed of site , Isn’t it ? I have learned the importance of usability of and I do always check all the points of usability that yu had mentioned above. And I really appreciate you for sharing information to all. Thanks for the kind feedback, I’m glad you enjoyed the content in this post. Good to have you as friend, Siva. There is always something new to learn from each other. And great to hear you connected with many of my circles. If you look also at my social profiles, you can find many more names to get in touch with. If you add a multimedia to your blog, like a video, it won’t affect your loading speed. For example, a YouTube video, as it is hosted on their server, not yours. And you are increasing the experience of your users, which is very good. just left my views on your latest blog post. There are a lot of good ways to make your blog better, but you nailed most of it here in this post. I really like the part about images because choosing great images can really magnify how great a post or even a blog is. If you choose the same stock photos that EVERYONE else chooses, then you won’t stand out but if you create your own images, or modify images or choose unique ones that are barely used, you’ll be doing yourself a huge favor. If I could, I’d add one more thing. Make sure you write in a way your readers understand. Meaning no complicated words, etc. I found out that creating compelling and personalized images, sometimes funny, are a great way to be unique and stand out from the millions blogs out there. Writing in a easy to understand format is a way to reach more readers. I’ve just left a comment in your latest blog post, Andrew. Another great post with very relevant and practical tips to improve the blog. It happens to many competitive bloggers that they engross in creating awesome contents so much so that they miss doing several auxiliary things which help readers to stay more and enjoy more their each blog post. It is right that one should not keep amending his blog design but a little improvement is always a welcome step and one should keep bringing smalls changes into it. Readability is very important point, in the beginning sometimes I failed to make up my mind to go through the whole post of a blog without any reasons but later I came to know its poor formatting and font size were the reason behind my lack of interest. Thanks a lot for sharing this great post of huge value. I think that keeping simple and clear is one of the evergreen tips to gain readers and keep them hooked. Hi Erik, thats a great post for every one. The new bloggers can take a heed of it and the old ones can check if they missed out something. I Have recently started using custom made images, trust me it gives an extra layer of happiness. I am also assuming my blog is a little one so i cannot afford all the paid stock images. The free ones are good tough with a lil editing that can be perfect. I also vouch for the social media connecting.That would be a mistake if not taken seriously. Have a great weekend. :). glad you confirm the points I listed in this post. That’s right, visual marketing catch your readers attention. Readability and usability are the key elements to make a better blog, as I personally think. For an example, suppose a blog post is written well with ample of information. But what if the users can’t read it or use it properly. All the efforts would go wasted. So I think it’s really necessary to give some more time on improving theme styles, typography and visualizations. Thanks for sharing your views, Abrar. Helpful topic indeed! You have shared some great points to consider here. 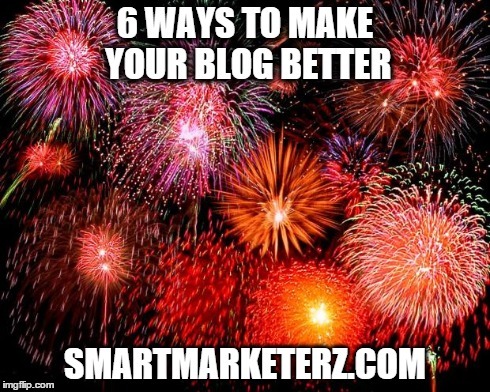 All the 6 ways are essential to make our blogging better. Checking your blog usability is very important. You should not miss out this point otherwise; you can face low traffic and decrease in SE rankings. Thanks for pointing out these essential things to make our blog better. we should always put ourselves in the shoes of our readers. In this way, we can understand also the other side of our blogs. Everything required in making a blog better has been put up very well in this post. Really like the attention given to finer details. By the way I also use the Magazine pro theme, it’s awesome right ! What I love of Genesis Framework is that you can personalize the theme as per your likes. i guess the six tips you mentioned about making your blog says it all. I love the No 1 point because that was the first thing that I considered and must say give me a lot of headache when I first created my blog.. Ha d to think of the look and even colors because like you have mentioned it is about first impression. Usability is very important. I see most blogs have templates that make navigation difficult and they somehow expect high traffic. Images and video cannot be left out. it’s a thin line between a cool blog and a boring one. Connecting to social media is a must as how will people be able to share your content if you don’t have one. Thank you for a wonderful post. Have a splendid week. glad to see you here and you liked the post. I think the theme you choose is very important. After that, writing good content is definitely the most important part. Also usability must be taken into account. Put yourself in the shoes of your readers, and you will know what to do. I see you landed from BizSugar, I love that community. I always invest some time promoting the content there, or browsing other stories, while engaging with friends. I have found that many blogs are adequate as long as their content is really good and helpful. I just don’t want to be distracted by something that has nothing to do with why I’m there. I feel that mutlimedia is HUGE! I have seen a significant up-tick in traffic and time on page when I include a video. It’s been really amazing to see it. I’m even thinking of putting a slideshare in where people can download the pdf of the article with active links, etc. The one thing I wish more sites did was add their social media share links. I’m still amazed at how many sites I come across that don’t have them. I’m also shocked at how hard it is sometimes to share pages from the sidebar share options on Google+. I have to zoom out in order to get to the share button. Let’s make it easy for people to share our content when they want to give us some love!!! Have a great weekend Erik!!! what a pleasure to see you. Pop-ups are among the few things that really annoy me of a website. It must be really good content to keep me staying at that blog, after a pop-up. Also, some of them are set to appear right away…Well, if you want to add a pop-up, at least do it after 30-40 seconds a visitor landed on your site! Adding a video will increase engagement with your audience. Even better, if you are the protagonist. I often add interesting multimedia to my posts, of course relevant. They add value to the article. As you said in your final point, also usability is important. Put yourself in the shoes of your readers, and you will know how to better tweak your site. Thanks for being here commenting and leaving your views, Don. The irony is that, I am experimenting with no image articles on my blog. That might sound as a bad idea, but till now no negative thing to note. The look, readability, loading time and visuals can take the blog a good user experience level. good experiment you are running. I would love to hear some feedbacks from your readers. I still believe some multimedia enrich users experience. Making a blog better is what every blogger including myself will of course be aiming for but what mostly arises is how to go by it. The issue of improving the speed of my blog is what I obviously ought to aim for. Glad you enjoyed the post, Kabie. I appreciate your posts when they come into my inbox and always take something great away from them. Every now and then it’s great to be reminded of the starting point again and go back in and design some more attractive for users in my sites. Thanks for sharing and really enjoyed!